The 57th annual Grammy Awards ceremony took place tonight, and a number of this year’s classical winners are familiar to Classical MPR listeners. We’ve provided this list of the award winners in the classical-music categories, along with links to features we’ve done about some of these winners. Listen to Fred Child’s interview with John Luther Adams from Performance Today. Revisit the New Classical Tracks episode about Hahn’s album. Listen to the New Classical Tracks episode about Vieaux’s album. Listen to Lynne Warfel’s Flicks in Five episode on the music of The Book Thief. The late Stephen Paulus was featured in the “in memoriam” montage, as well. I’ve always imagined Yo-Yo Ma to be a fun-loving guy. From his photo op with a wombat to his inspired modern dance collaborations, Ma seems to be a guy willing to go the extra mile in the name of art, or simply having a good time. 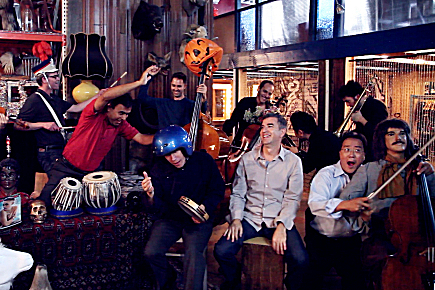 NPR Music’s latest Field Recordings video does both: art + a good time. When you’re lucky enough to have cellist Yo-Yo Ma and members of the Silk Road Ensemble, some of the world’s premiere instrumentalists and composers, gather for an afternoon of offstage music making, you’ve got to think long and hard about where to put them. And we decided that the perfect match would be ACME Studio, a theatrical props warehouse in Brooklyn. And if that weren’t enough, there are some fun animated GIFs from the session too. If you had the afternoon to spend with Yo-Yo Ma, what would you do? From an array of computer-controlled set of water nozzles, you can create just about anything. So it’s unsurprising to see logos, hearts, and musical notes emerge from some of Germany’s Watergraphics fountains. But then this animated gif came along. The quarter notes and eighth notes are great, but there’s something about the treble clef, with its intricate swirls and lines — it ought to be impossible to create as a fountain — but there it is, precise, and temporary and… gorgeous. 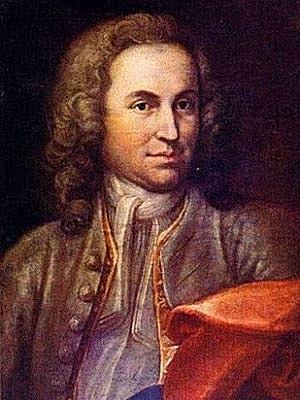 Was Bach a teenage bully? New research indicates that one of the greatest composers of all time may have a life story that’s been cleaned-up to preserve the image created by his pristine works. Conductor Sir John Eliot Gardiner has been digging into the records… and the results are jaw-dropping. Gardiner’s findings will be published in the UK on October 3 (stateside Oct. 29) in the book Music in the Castle of Heaven: A Portrait of Johann Sebastian Bach. Looking for a little levity in your day? Look no further. 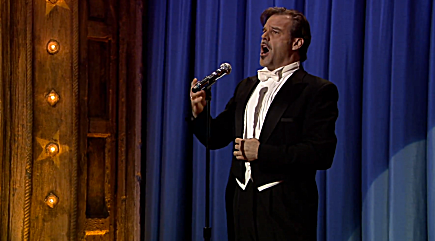 Late Night with Jimmy Fallon has a segment that features suggestions from the audience  appropriately entitled “Suggestion Box”  and last night’s segment featured a wish from Stephanie Ellis to hear the “Meow Mix” jingle sung by an opera singer. Fallon was more than happy to oblige. He brought out Richard Troxell, best-known for his portrayal of Lt. Pinkerton in the 1995 film version of Madame Butterfly. And he delivered. You may be ‘Miss Taken’ when it comes to America’s biggest pageant and its relationship to classical music. The conventional wisdom about the Miss America pageant is that it is a vapid, image-obsessed parade focused on physical beauty above all else. Conventional wisdom often gets it wrong. Two great stories emerged around this year’s Miss America contest — and they’re both tied to classical music and education in a major way. 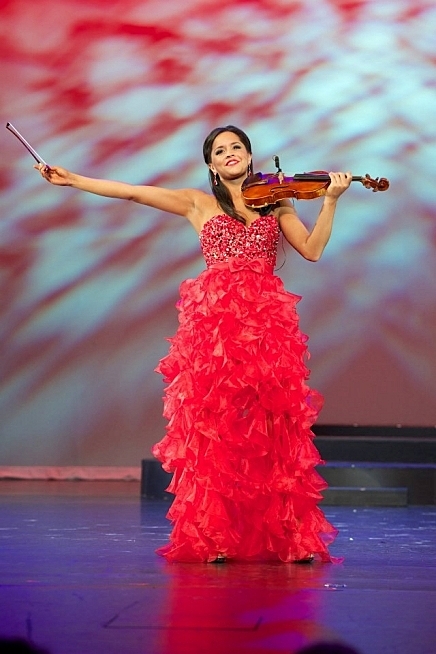 The first: Miss Minnesota, Rebecca Yeh, (pictured above) is a classically-trained violinist, who competed as a Featured Round Artist in Classical MPR’s own Minnesota Varsity showcase. While Yeh didn’t get the tiara, (she was an impressive fourth-runner up) she wowed them with her performance of Wieniawski’s “Scherzo Tarantelle.” Her performance was so strong in fact, she won the preliminary talent competition earlier in the week. But that’s not all. Using her first-person experience with her brother’s Autism diagnosis, she also speaks eloquently of the need for Autism awareness and advocacy in the public school system. Read a profile from her hometown newspaper, the Brainerd Dispatch, or see her introduction from the Miss America YouTube channel. The second story emerging from last night’s pageant features another violin super star: Joshua Bell. Perhaps eclipsed by the crowning of Nina Davuluri as Miss America, the Miss America Organization’s announcement of a new partnership with Education Through Music (ETM) to support education in schools didn’t receive too much attention. ETM is an organization that partners with inner-city schools to promote the use of music in schools as a means of enhancing students’ academic performance and general development. 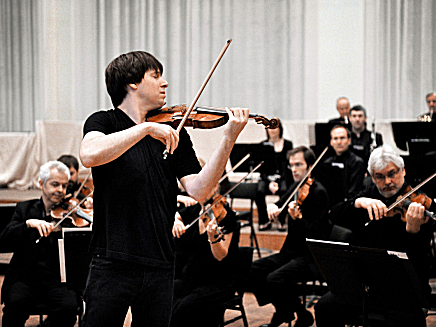 Joshua Bell, world-renowned violinist and ETM Board Member, forged the partnership when invited to become a judge at the Miss America Pageant this year. “Music enhances the lives of children in so many ways, which is why it is so important that music education be valued in our society. My own commitment to music education has brought me to many public schools, as well as established music academies, and I have seen first-hand the positive effects of music education on these children. Music teaches about beauty, logic, mathematics, language, teamwork, and individual expression. Having seen many ETM students with their own instruments in hand, beaming with a sense of accomplishment after having worked together to create something beautiful is nothing short of thrilling. 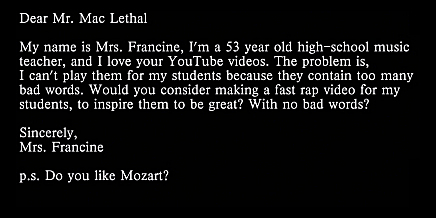 I don’t think there is a human alive who could witness this and then argue against the importance of music education. Having learned of Miss America’s mission for educating young people, I was pleased to introduce The Miss America Organization to Education Through Music, and even more thrilled at the excited responses received from both organizations to the idea of joining forces to improve music education,” says Bell. Davuluri, will use the partnership to focus on STEM curriculum in the schools as she tours the country this year. “During her year as Miss America she will serve as spokesperson for STEM (science, technology, engineering and mathematics) this year as she travels to Washington, D.C., to work with the Department of Education,” a statement from the Miss America organization explained. So the verdict on Yeh and Bell: good looking? Yes. Vapid? Hardly. This month, as part of our Voices of Spring programming, we’re having a little fun with those who make the music. We’re asking the singers, choir directors and vocal performers to share with us a little observational humor, so we’re taking #ChoralTruths to Twitter. We’re hoping that you’ll share with us something that you see as being a universal truth from your spot on the risers. The example we’ve been using is: “Altos always carry pencils.” We don’t know why; but it does kinda seem true. Have you ever seen an alto not carrying a pencil? We’ll pick the best and share them on Twitter and here too. So go on, be merciless… and let us know your #ChoralTruths! What would you want to hear for your last commute? Longtime listener Patrick K. wrote in, telling the story of his daily commute home. After 20+ years at the same job, he’s retiring, and was wondering what Friday Favorites host Steve Staruch might recommend for his final Friday Favorites as a commuter on March 29, 2013. For Friday Favorites this week, I wonder if you could play something to help me celebrate my final commute? I’ve been making the drive from Ramsey to MSP Airport–and back–for the better part of 20 years, and Classical MPR has been my “buffer” along those thousands of bumper-to-bumper miles. And Friday Favorites has been there for many of the wearisome end-of-the-week treks home. I retire on Monday – April Fools Day. No joke! And so on my last Friday evening commute, I’d like to hear something that celebrates the journey. . . .
As is somewhat customary at Classical MPR, Steve sent an email to the staff asking for their suggestions, and they came pouring in. Adams Short Ride is always good. Copland Sunday Traffic. American in Paris recommends itself with those taxi horns. The last bit of Peter Hope’s Momentum Suite? The Theme from “Airport” (Alfred Newman). What do you think we should play? Suggest a Friday Favorite song for longtime listener Patrick! We want to celebrate his final work commute on the 29th. When you think of pieces that speak to travel, change, or celebration, what comes to mind? Joshua Bell, on participating on an Academy Award-nominated song with Scarlett Johansson. “Before My Time,” written by J. Ralph from the movie Chasing Ice. Nominated for Best Original Song.